By Jon Callard, Creative Strategist, with cover art by Gerson Granados. 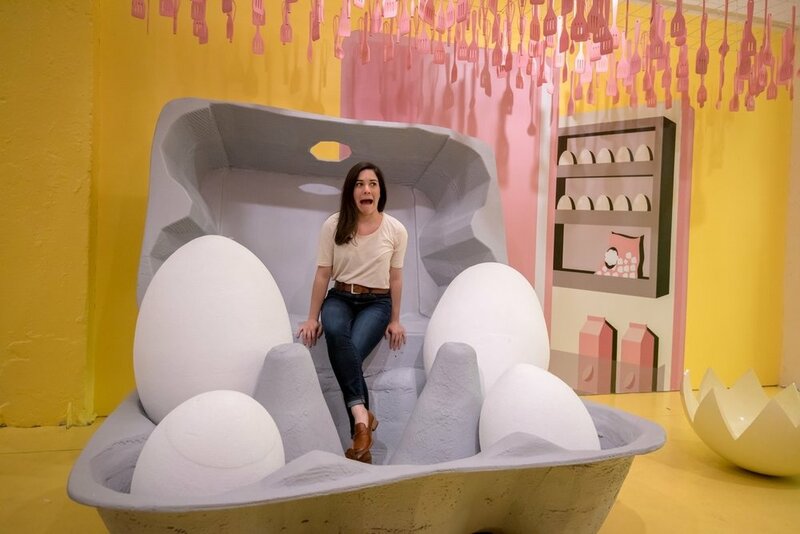 The Museum of Ice Cream was the first experience (of many) to prove that millennials will shell out $38 for a colorful photo op. Now these “Instagram Museums” are popping up everywhere. But before you jump on this particular experiential bandwagon, carefully read this analysis and consider our ground rules for how it can be successfully deployed by brands. Events designed specifically for social media offer the opportunity to organically combine three audiences under the same roof: consumers, influencers (including press), and the social media followers of those IRL guests (media impressions). This holy trinity creates a reinforcing synergy cycle that boosts attendance, impressions, and exponentially increases the campaign’s impact and reach. While this marketing trifecta brings obvious value to the ROI equation (always a challenge to prove with experiential marketing), it also brings a unique challenge for brands. It’s difficult for a brand to pull off this type of event because the three audiences are usually managed by three different departments within the company (PR manages press, Marketing handles events, and the Social Media team handles social and influencers). Getting these disparate departments to share ownership, budgets, and play nice on such an ambitious campaign is usually the first major obstacle - one that has prevented many brands from exploring this exciting experiential space. For those that can overcome the internal brand obstacles, we’ve put together a few rules to help guide the creation of a successful social media pop-up activation. If done correctly, this type of event can invoke the holy trinity (consumers, influencers, and earned media) and be a great boon to your marketing endeavors. If executed poorly, you could end up with an expensive event met with eye rolls at best or the social media equivalent of the Fyre Festival at worst. Make it a real experience. Not just a photo op. People should get a great experience AND great photos. If it’s simply a photo op, then you’re just paying for your own vanity - more of a modern day “glamour shots” than a part of the experience economy. Clearly, there are many people happy to do just that (without an hint of shame or irony) but if there is at least a semblance of a unique experience underpinning the photo - people will have an authentic reason to share it (and more people will do so). At least not overtly. If you want to get a lot of people to attend, experience, and share your activation, it has to feel like it’s all about them. Brand or product messaging should be subtle. If your marketing message is too strong, it will turn people away. Tell a good story. You may need more than a product message. Just like the focus should be on the experience over the photo, the reason for the activation should encompass something bigger or deeper than the product you’re trying to promote. Millennials don’t want to feel marketed to (cliche, but true), and they don’t want to overtly promote products. BUT, if you can align the activation with a worthy cause or a positive message (like Fast Food Aid), you’ll find attendees beyond eager to share their engagement experience. Of course, if your activation is based on something that is intrinsically pleasure-inducing (like the MOIC or the Rose Mansion) then you don’t need to worry - attendees will happily share without any further cajoling. If you’re trying to reach males over 40, then you probably don’t want to mimic The Color Factory. When developing your activation, consider something that aligns with both your objectives and your audience’s interests. What social media platforms does my audience use? What kind of imagery would my demographic want to share?For example, Filson, the rugged and historic American outfitter, probably wouldn’t attract their customers with a photo op in a bathtub full of neon sprinkles. A slow-motion video of them axe throwing, however, would be more on target (bad pun intended). ﻿Remember Rule 1 (make it a great experience, not just a photo op)? Well, you still need to provide a great photo op. This is the lifeblood of the whole campaign, the reason people attend, the way people find out about it, and the means by which we pay off ROI. Put thought into the design so that it looks amazing AND reinforces your message. Make sure to light it properly so it makes attendees look good. And please, don’t just throw a bunch of colorful Chuck-E-Cheese balls in a box. Do something original. For help with this, we recommend a good creative agency. We think Volkswagen pulled this off admirably with the launch of Jetta Haus. A great blend of robust experiences and product stories paired with unique Instagram candy - all laser targeted for a millennial audience of consumers and influencers online and IRL.